For investors, the hype around blockchain has been a mixed blessing. We’ve seen micro cap stocks more than double in value overnight simply by incorporating the word “blockchain” into their name and making vague gestures toward a pivot. We also have the case of Overstock.com, whose stock prices have soared and plunged repeatedly after the online retailer committed to substantial investments in blockchain technology. Investors, surely, have noted the common denominator between nearly all blockchain-associated investments: Tremendous volatility. The cryptocurrency space experiences double-digit market swings on a regular basis; this volatility has so far been somewhat transferable into more conventional investments with blockchain exposure (even though, it should be noted, blockchain and cryptocurrencies are separate entities -- you don’t need the latter for the former). Savvy traders are, of course, aware of these swings and many have been profiting from them. One industry that should draw particular interest from traders moving forward is the energy sector. Few industries are better suited to reap the benefits of this technology, and as blockchain matures, a new wave of growth may be imminent. The energy space is no stranger to innovation. In recent years, technological advances have allowed for the extraction of oil and gas in areas where it was once too costly, for example. Blockchain represents the next frontier. For those who are unfamiliar with the technology, blockchains are simply decentralized and distributed ledgers where transactions are recorded and verified without the need for third-party validation. Once a transaction is recorded, it may not be altered. In this way, it offers a secure method for tracking and transacting without the need for a trusted authority. Currently, BP is developinga blockchain-based futures platform and exploring the use of distributed ledgers for financial settlement and reconciliations. This investment comes on the heels of other high-tech investments the company has made, including one involving artificial intelligence and a strategic fuel supply partnership with a firm that offers an “Uber-style” service for private jets. Meanwhile, Royal Dutch Shell bought a minority stake in a distributed ledger startup firm, Applied Blockchain. Johan Krebbers, a Shell CTO, said that blockchain technology has “huge potential to shake up how we do things in the energy industry from streamlining processes, to simplifying how we work with suppliers and serve customers. Supply chain management also looms as an obvious use case for blockchain technology. Extraction, management and distribution of energy at global scale is a massive undertaking that is rife with opportunities for increased efficiency. Blockchains allow for the tracking of goods through each step of the process, reducing the potential for fraud and waste. Blockchain can also replace existing methods of financial record-keeping -- systems that often use email, paper, faxes, phone calls etc. Moving to a pure blockchain-based setup could potentially save billions of dollars by eliminating inefficiencies and material costs. As mentioned above, the emergence of blockchain has created extraordinary price shifts in equities with even marginal exposure to the technology. 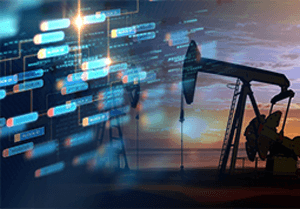 As blockchain technology matures and becomes more integrated within the energy sector, similar opportunities should arise for futures traders. Blockchain holds the potential to unleash extraordinary new growth in the energy sector -- and could play an integral role in the next boom cycle. As a follow-up to this article, we suggest the following two guides to further your futures trading education.